Drive south on Hwy 11 (Hawaii Belt Rd/Kuakini Hwy) from Kailua-Kona for about 20 miles until you pass the 102 mile marker. 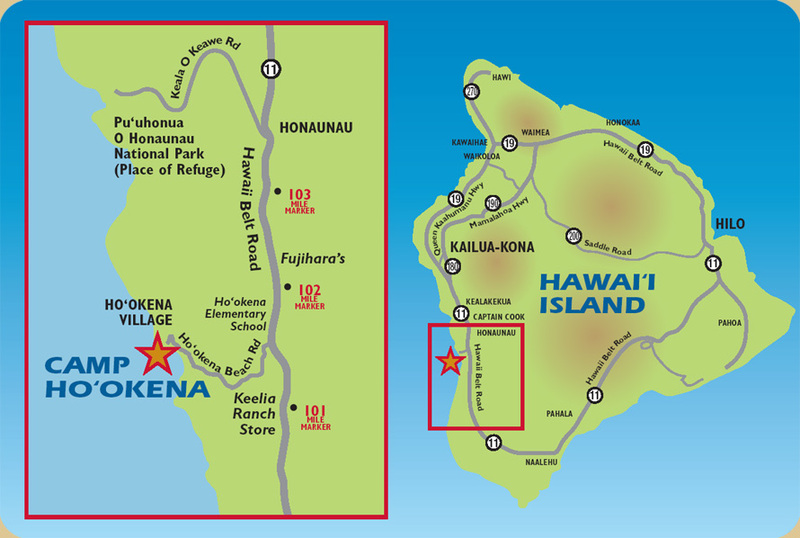 You will also pass Ho'okena School located on the right side of the road. After you pass the school, look for Ho'okena Beach Road on the right side of the road; turn right on to Ho'okena Beach Road. You will be on this winding road for about 2.5 miles before you reach the park. When you near the end of the road, take a left down a narrow one lane road. You will see a dirt parking lot and the ocean ahead of you. A rock wall lines both sides of the road. A restroom is located above on the parking lot (on your right as you drive down the lane toward the beach). We are in the Concession Stand located on the left side of the parking lot. Look for our signs and canopy. Drive north on Hwy 11 (Hawai'i Belt Rd/Kuakini Hwy). You will pass the 101 mile marker and Kealia Ranch Store. Ho'okena Beach Road is the next left. Take the left down Ho'okena Beach Road. When you near the end of the road, take a left down a narrow one lane road. You will see a dirt parking lot and the ocean ahead of you. A rock wall lines both sides of the road. A restroom is located above on the parking lot (on your right as you drive down the lane toward the beach). We are in the Concession Stand located on the left side of the parking lot. Look for our signs and canopy. are copyrighted and are the property of KUPA.